Yes, these are the days the sunshine girl in me longs to shed all those layers and the only hat I want to wear is a sunhat. Preferably a pink one. With pink flipflops to match... its not that much of an ask, is it? Which is probably the reason why I got almost giddy with excitement when I saw these mangoes in the Asian supermarket. Now, they are not the almost headily perfumed Alphonsos that I am used to, but Ataulfos from Mexico... and even though my self declared 'food snob' pal Addie would turn his nose up at them, for me, the fact that these guys were actually perfectly ripe and even better smelled like mangoes, was a no-brainer buy buy buy moment. So I merrily grabbed a whole case ($12.99, if you're wondering, and they are in great shape too) and turned out the whole lot into my beautiful fruit bowl... and spent an evening just looking at their lovely, yellow, goldenness... then chased away kid and husband, and spent an evening just dreaming about what I would make with them. Oh, and I also found proper, ripe papayas. My tropical cup of life is brimming over right now, isn't it? And I had the funniest experience in store as well. I reached out and grabbed a papaya, and the little elderly Asian lady beside me smacked my hand away and almost growled... 'mine'. Haha, I know how you feel, lady... a primal possessiveness comes over us when we see tropical fruit that has eluded us over the long cold winter. I still got a couple of perfectly ripe papayas, by the way, and for a change, they actually tasted like they had been tree ripened. I miss the days when I could head out into my garden and pick a perfect papaya off the tree, after which mum would peel and slice it up for breakfast. Small pleasures that we took for granted then, but ones that I know I will never be blase about again. Like watching the torrential monsoons, cosily tucked up in a warm blanket with hot pakoras, or even that perfect hot cup of tea that my dear, patient mum would bring to us in bed, as we sleepily muttered and grumbled our way out of dreamland. So what did I do with those jealously guarded mangoes? Well, I was a miser and portioned out a few to the kid and Kay, freshly peeled and cubed. 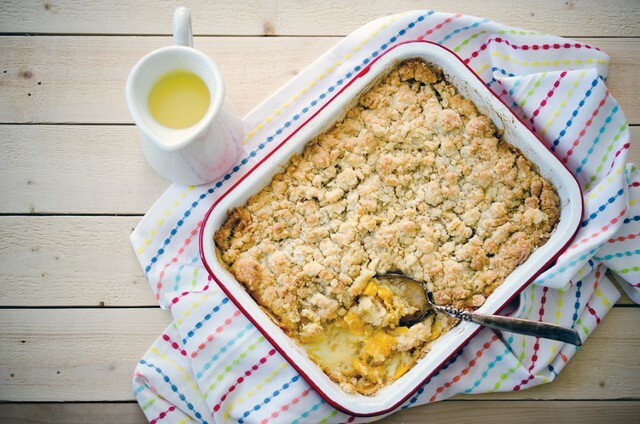 Then I used some to make this simple, yet delicious mango and ginger crumble. 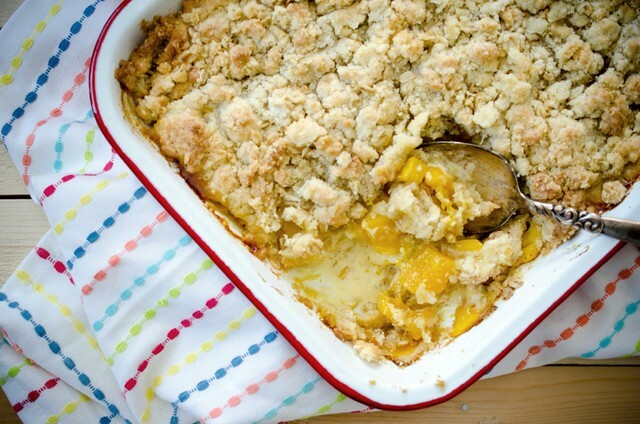 Strangely enough, the first time I had mango crumble was at a friend's in England. He was Italian, and a true food connoisseur and she was the typical English rose. So when we went to their home for dinner, we almost always had a fabulous Italian meal, with an English dessert. She made this mango crumble for me, because she thought I would appreciate the tropical element :) All I wanted at that time was a rhubarb one, but it was the thought that counted, right? Preheat oven to 350 F/ 175 C.
To make the crumble topping, place the flour, oats, sugar, salt and ground ginger in a bowl. Rub in the butter with your fingers, until the mixture resembles very coarse breadcrumbs. Stir in the candied ginger, if using. Add the water, a tablespoon at a time, until you can just clump the mixture with your palms. 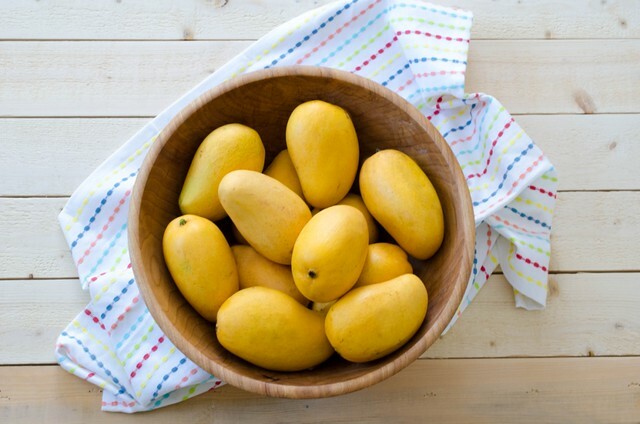 Make the filling – place the mango chunks in a large bowl, and add the ginger, white grape/ pear/ apple juice and lemon juice. Mix together gently. Place the fruit filling in an ovenproof dish, and sprinkle over the sugar. Clump the crumble topping over the fruit, until it completely covers the filling. Place in the preheated oven and bake for about 45 minutes, until the topping is crisp and the juices in the fruit filling are bubbling. 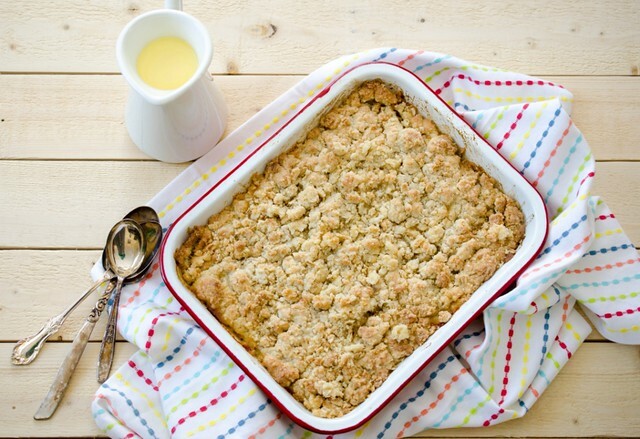 I like to serve the crumble with homemade vanilla ice cream, crème anglaise, or lightly sweetened whipped cream. I love your writing style - it's humorous and makes me smile! :) As for the mango crumble, I absolutely love crumbles and mangoes and can't believe I never thought of making one before. Come summer and I am sure to try this. Am surprised how you saved those luscious mangoes and made this desserts...mango crumble sounds so yum and totally Indian! Mmmm, great idea..and guess who just bought a box of mangoes? Moi!